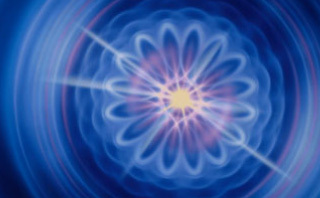 The threefold flame, or divine spark, is the seed of the divine within our heart chakra. It is the seed of the Inner Christ and the Inner Buddha. The threefold flame embodies the same qualities of love, wisdom, and power that manifest in the heart of the Almighty, in the heart of your I AM Presence, and in the heart of your Higher Self. This divine spark is your passport to immortality. The threefold flame resides in the secret chamber of the heart. 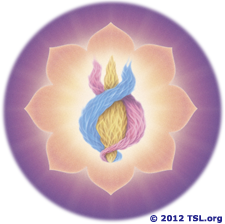 It is the Eighth Ray and the eight-petaled chakra. It is like the antechamber to the twelve-petaled heart chakra. The heart is the soul's link to divinity. This is because the I AM Presence placed a spiritual flame—the essence of itself—in each one's heart. This flame is also the essence of God, because the I AM Presence is an emanation of God. Right within your own body temple are three fiery plumes of the Holy Spirit—pink, yellow, and blue pulsations of living flame. Thus the heavenly Trinity gains expression in the world of material form. And the energies of Father (blue), Son (yellow), and Holy Spirit (pink) are resplendent in the heart of man. • Love to fulfill the destiny of the soul in conscious outer manifestation (a just and merciful compassion that is always rewarded by individual creative fulfillment). The flame within the heart is your personal focus of the sacred fire. It is your opportunity to become one with your Higher Self, whether you call it the Christ, the Buddha, the Tao or the Atman. It is the potential of your Divinity waiting to burst into being within your humanity. Long ago, during the first three golden ages before man's departure from innocence, the crystal cord was nine feet in diameter and the threefold flame enveloped his form. Man's source of energy was literally unlimited and his higher consciousness was all enfolding. After the Fall, man's opportunity to exercise his free will was curtailed. By cosmic edict the threefold flame was reduced to one-sixteenth of an inch in height. As the flame of illumination expands from within your consciousness, it gradually enfolds your being until God, as holy wisdom, is enthroned upon the altar of your heart. But with each increase of wisdom, the power and love plumes must also rise by the fiat of your devotion; else the wisdom will not be retained. 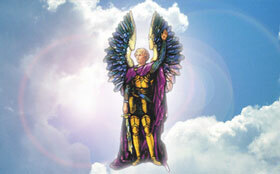 Likewise, with each getting of power there must come the attainment of wisdom and love in perfect balance. So, too, love is actualized only through an equivalent manifestation of power and wisdom. On the average, the threefold flame is one-sixteenth of an inch in height, but its plumes are usually not the same size. Only when the three plumes are in balance can the threefold flame expand as a whole. And when your threefold flame expands, your spiritual light and power will increase exponentially. Create more joy, healing, or peace in your life! These chakra lessons take you step-by-step through a process of not just balancing and purifying your chakras, but definite steps to seal and protect them. How can you balance the three plumes so that they are equal in size and intensity? Through devotion to God and service to life. Saint Germain advises us to meditate on the qualities of each plume to determine, through our soul sensitivity, which of the three is the weakest and which is the strongest. Then, he says, we can use the power of the strongest plume to strengthen the two weaker plumes. You can tell when your plumes are not balanced by how strongly you feel God's power, God's wisdom or God's love in your heart. If you do not feel the first, second or third plume of the Trinity pulsating in your heart, then you know that you must exercise the neglected attribute or attributes. For instance, if your blue plume is your strongest plume, then it is in command of the yellow plume as well as the pink plume. 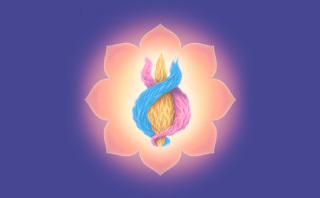 Maintain your strength in the blue plume and use it to shore up the yellow and the pink plumes. Then take action to increase the pink plume and the yellow plume, thereby attempting to establish equilibrium between the three even while you fan the fires of the heart. If you have a tendency to withhold love from your adult self, from your inner child or from others, go out and find those who need your love and give cup upon cup of Love's elixir to all who will receive your love. Stay with this assignment until you feel the strength of God's love in your heart and you know of a certainty that you have brought the pink plume to the level of the blue plume. Now, if you sense that you are not exercising the wisdom God gave you—by teaching the illiterate to read and write, for instance—then bring the sunbeams of God's wisdom to those who need them most. Serve others selflessly and you will know the freedom of giving away the gifts of the Trinity. Your goal in this process is to balance the threefold flame so that the love of your heart may also be equal to the intelligence of your mind and to the determination of the will of God that he sealed within you in the Beginning. Give this decree with Elizabeth Clare Prophet. 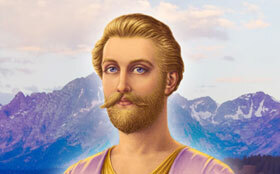 The ascended master Kuthumi teaches a threefold exercise that we can give to strengthen the sheath of the aura so that we can maintain the consciousness of Christ, of God, of Buddha, of Mother. The threefold flame is the energy of the Father, Son and Holy Spirit—of power, wisdom and love. Its three plumes are blue, yellow and pink. In our studies with the ascended masters, we always begin with the flame in the heart because it is the point of our own reality; it is the spark of life and our seat of consciousness. And the outreach of that threefold flame that is one inch in height may span half the world itself – so stupendous is that power, wisdom and love of Father, Son and Holy Spirit when it is connected with the Divine Mother. The key chakra of the temple is the heart, because within the secret chamber of the heart center is the threefold flame of life. The threefold flame of life is one with the Father, Son and Holy Spirit at all hours of the day and night. And therefore right within this body temple, upon the altar of the heart, there is burning a flame that is actually God in manifestation. It is through this flame that we can invoke the light of Father, Son and Holy Spirit. To give Saint Germain's Heart Mantra, begin by visualizing your heart chakra as a dazzling sphere of white light. Picture the brilliance of the sun at noonday and transfer that picture to the center of your chest. Visualize the light of God's heart shining through your heart. See thousands of sunbeams going forth from your heart as light rays to penetrate and dissolve any darkness, despair or depression within you or the people of earth. If you will call to me, you will, beloved, have the Electronic Presence (in other words, the immaculate image) of my threefold flame superimposed upon your own as a magnet to impel you to increase that threefold flame according to the divine pattern rather than according to the old ways. Only the threefold flame expanded can take you where you must go. I say “must go,” beloved, for there is truly an impelling to enter the heart of hearts of God in his holy mountain. To assist this spiritual aspiration, the ascended master Zarathustra dictated a decree, O Mighty Threefold Flame of Life. Decrees are more than mere poetry because they are charged with the radiance of the master. He said that while you give this mantra, he will place his electronic presence over you, realigning your chakras, assisting you to balance the threefold flame and to bring God-control into every aspect of your life. This flame that burns within your heart is the divine spark, the potential of your divinity. It is the gift of Life of the Creator to the creation. HThe consciousness of the Son is centered in the flame, which is thus called “the Holy Christ Flame.” This Trinity of God’s sacred fire focuses the primary attributes of Power, Wisdom, and Love—his bestowal, flame of his very Flame, to every son and daughter. Join The Summit Lighthouse chakra page on Facebook! We now have a Chakra Lessons page on Facebook. Join our conversation and check out the latest posts on chakras, your divine spark within your heart chakra, and the human aura! Here is John writing in the midst of the church saying that God desires to deify man which can only mean that he desires to make man God. I don’t understand how he gets away with it.